We’ll be supporting you, now and in the future! our favourite heroes to come! From Adrianna. “Me and Bunny-chan getting ready to eat fried rice ❤ Kotetsu obviously took the photo." From Tania. 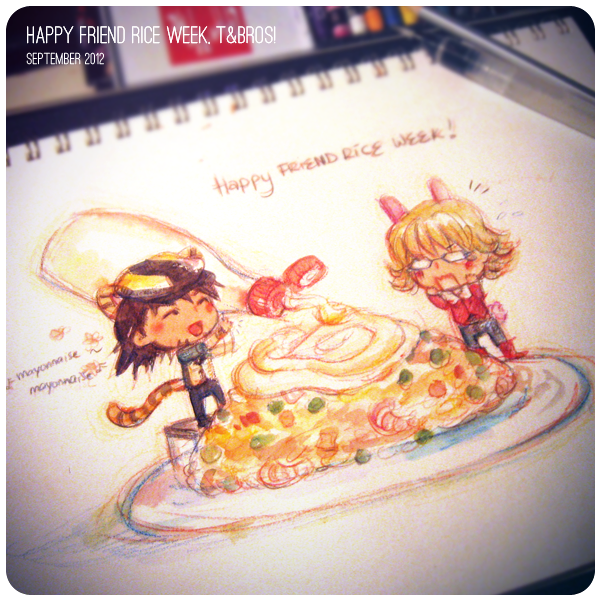 “With love to the T&B wonderful staff and all the T&Bros out there <3"
From @tervaperse with @Fuuyuku as Kotetsu. From Alexandra as Yuri Petrov. I loved seeing everyone’s beautiful fried rice (and all the merchandise and cosplay)! I love this fandom so, so much. <3. Thanks (and thanks again) to Aki and derpchan for organizing this event, and for always keeping us up-to-date with the latest T&B news! (Also, thank you for highlighting my drawing ;A; )!